Ok, I admit I’ve proclaimed this distinction before, but this time I REALLY mean it. 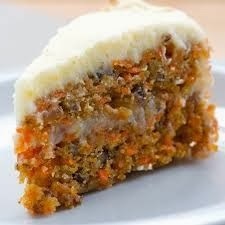 Anyone who is a carrot cake aficionado needs to try this recipe just once. Considering there doesn’t seem to be anything really that different about the recipe, I don’t get it. Why is it so much better than I remember carrot cake being? Anyway, Crew Member Shay, brings this in from time to time, and he’s kindly offered the recipe to our CSA members today. I know some Large Share Garden N Grove subscribers have quite a few carrots to contend with lately. (I’ve been juicing mine.) But today….cake. Preheat oven to 350. Butter and flour two 9 inch cake pans. Line bottom of pans with parchment paper. Whisk first 4 ingredients together in a medium bowl. In a mixer on medium speed, blend sugar, oil and butter for about 3 minutes. Mix in eggs 1 at a time then add flour mixture and remaining ingredients just until combined. Do not over stir. Divide batter in pans and bake for approximately 30-40 minutes or when a toothpick inserted comes out clean. Cool in pans for 15 minutes, then remove from pans and cool completely. Beat cream cheese and butter until light and fluffy. Slowly add powered sugar until well blended, then add maple syrup. Chill until you are ready to use. Frost cake and chill serving.